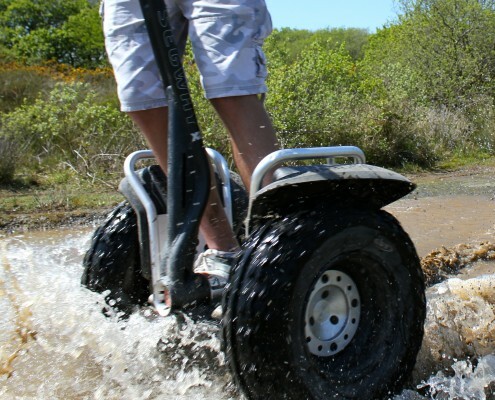 A 90 minute mix of both road and off road – get the unique chance to try the Segway i2 and x2 in one session!! With full training from an experienced instructor, full personal safety gear, dedicated training area and unique tour routes all included. You’ll start off with the Segway i2 in our training area and on the private roads. This will give you the chance to get to grips with the machine and learn the basic Segway manoeuvres. Glide exclusively around the tarmac route and circle directly underneath the huge iconic listed Arthur satellite dish. Once you’ve mastered this and the instructor gives the all clear, the speed limiter wil be taken OFF and you can ride the Segway to its top speed. You’ll then be ready to move onto the chunky x2 off road machine. You’ll learn about the differences and get fully trained for the off road experience. At Goonhilly this includes a purpose built obstacle/assault course with ramps, bumps, water trough and slaloms! You’ll also have a spin around some of the bumpy pot holed tracks and paths on site.